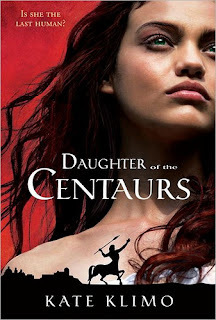 Today I have Kate Klimo, author of Daughter of the Centaurs, here on the blog to talk about her love for horses and how it led her to write her book! "Ever since I read C.S. Lewis’s The Horse and His Boy when I was ten, I yearned to have a relationship with a horse like the Boy had with Bree. I grew up on the posh North Shore of Long Island, where my parents did exactly have a posh discretionary budget for their five kids. There were lots of girls in my magnet school whose parents were rich, who had their own horses, and who rode to hounds and showed—but they weren’t my friends. My friends and I saved up our birthday money so we could take lessons at a barn in Brookville, where there are a lot of estates, but the people who ran the barn were wonderfully down-to-earth. I loved the smell of the barn: hay and dung and horse sweat. I guess you could say that, over the years, I sought out that singular olfactory stimulation. When I grew up and got married I rode horses wherever we went on vacation (Hawaii, in a bathing suit, to waterfalls; Sedona on the rocky trails that wound through the red rock; Mexico in the mountains through shanty-towns and jungle). But it wasn’t until my fiftieth birthday that my husband got tired of hearing me mooning about horses that my relationship with horses began in earnest. He gave me a package of ten lessons at a barn just across the street (so no excuses!) I started taking lessons weekly, both private and group, burning through that ten pack in under a month. Those lessons became a budget item. The folks who ran the barn, Suzanne Shepherd and Bob Jeffreys (the man to whom I dedicated Daughter of the Centaurs), were natural horsemen and Suzanne is a high-level Centered Rider so you might say that my formal equestrian education is Centered Riding, which is a wonderful combination of Eastern philosophy and traditional practice. It has to do with being one with the horse and the centaur is an image that Centered Riding teachers frequently give their students to promote fluid movement and “one-ness”. Bob and Suz are well-known on the horse circuit, teaching clinics and giving exhibitions at equine expos in the US and Canada. I shared my group classes with eight-year-old girls who were ruthlessly snotty. They’d tell me when my heels were up or my hands were too busy or I had failed to cool down my horse sufficiently after a work-out. It was like being the geeky new girl in the fourth grade: out of step, out of tune, klutzy, infinitely uncool. What can I say? Probably more than anything else, it was those eight-year-old girls who fired my ambition to keep at it. I doubled up on the lessons, I gave over every vacation to week and two-week clinics. I took a share in a horse so I could practice every day when I got home from work, alone in the arena, just me and a speckled roan named CJ who had a jaw-jarring gait but the sweetest disposition and a miraculous built-in filter that enabled him to interpret with enormous clarity my often garbled cues. After a few years, the eight-year-old girls had less to pick on. In fact, they were the ones asking my advice and I was on my way to being infinitely cool (Hah!) I bought my own horse, a blanket Appie named Pie who had been a ribbon-winning barrel-racer. I learned that a horse was a mirror of my own moods, that I could never lie to a horse, that if I was unhappy a good ride could smooth me out, that horses had incredible kindness and compassion; that horses made it possible for me to be in the moment and not leap ahead to “what next?” I learned to be light and quiet with my hands, to follow my horse’s head, to be firm and never to let the horse think that he was in charge. But Pie had some issues. He had a tendency to spook at almost nothing, and I came off a lot. Once he bucked me sky-high and came down on my shoulder, breaking it in four places. That’s what got me into doing ground-work. Doing ground-work taught me more about horses than anything else could. I learned to control every part of my horse’s body from the ground. By the time my shoulder was mended Pie and I had arrived at an understanding and my ability to control all the parts of his body from his back made it possible for me to cut down on those nasty spills. My husband took up riding because it was the only way he could spend time with me. He bought a horse for a dollar, a swayback old quarter horse named Max, the model for the Apex’s Champion. Max looked like hell but he was the fastest thing on four legs and he had this wonderful way of keeping his body beneath Harry no matter how hard my novice husband bounced around on his back. He took care of Harry and never let him get hurt. My husband and I took vacations that were all about riding: to France, to Africa, to the Canary Islands. The Canaries off-season are bleak, like the surface of the moon: volcanic islands jutting out of the steel-blue Atlantic. There, we met a Dutch ex-pat who kept his herd of beautiful Spanish Warm Bloods in these old smugglers’ caves by the sea. I said to Harry, “This is awesome. Somehow, this will wind up in a book.” Those cave stables were my first glimmer of Daughter of the Centaurs. Not long after that, we went on a riding safari in Botswana and South Africa. I experienced what it was like to be on the back of what was, essentially, prey to just about every other animal in the bush except the antelopes. And it was in Africa, that I came up with the idea of the last human on earth being the alpha member of a herd of horses. The horses depend upon Malora to protect them from predators, everything from lions to ticks. Malora depends upon them to give her company, comfort, and transport. Knowing how she feels about horses, it is no surprise that she would have an affinity toward the centaurs, after they have captured her and her herd. She’s lonely for human company and she adores horses…which makes centaurs the perfect beings. That centaurs are no more perfect that people is just the first of many revelations Malora has when she comes in from the bush to what passes for civilization. In the first book, she explores the centaurs’ relatively homogenous nation-state of Mount Kheiron. In the second book, she travels up north to the Kingdom of Ka, to Kahiro, which is more of a melting pot, and in whose famed bazaar they say that you can find anything you could possibly want. Talk about shopping fantasies!" Thanks so much, Kate! Be sure to pick up a copy of Daughter of the Centaurs, available now!